After this chilly week, it's good to snuggle up with blog posts of Poetry Friday friends. Thanks to Tara for hosting our round-up at Going to Walden (isn't that the most marvelous title of a blog?). Last weekend was our annual birthday palooza. One daughter turned eighteen and another daughter turned twenty. Ever since the girls entered our lives, the weekend closest to their birthdays have been events. Two cakes to bake, sometimes a shared party, presents and time being family. As they grow into the adult world, my mother's heart remembers simpler times and misses my little girls. Linda Pastan's poem To a Daughter Leaving Home is a favorite. It brings up a longing in me. It became a mentor text to me in my writing this week. What a lucky poet am I to receive two more New Year post cards this week. They are just the ticket to chase my wistful thoughts of growing children into new creativity. Thank you so much, Robyn and Kay. I feel ya. My kiddos are 21, 18, and 17. Our babies aren't babies anymore, and the time went by so incredibly fast. I was truly touched by both poems. We have to hang on to those sweet memories, but we also have to remember to stay present. There are so many more memories left to make. Nice piping on the cake, Linda! Sounds like a good birthday-palooza. Your poem is so affectionate and respectful, building a positive relationship with a solid foundation. Your beautifully decorated cake reminds me of the artistic cakes my mom made for my children. Have a great weekend, Linda. That cake and that buttery icing... YUM! Your poem is lovely - and those keys jangling like an alarm clock were very real to me. Linda's poem would be a fabulous mentor text. Great choice! And lovely haiku for you - each different , but very beautiful. You are so blessed to be able to celebrate with them. My youngest went too far away when she was that age, so I had to be satisfied with a phone call on her birthday. I have to admit, though, I love having adult children. The adventure just gets better and better. What a magnificent way to capture the joys of being able to (and desiring to) connect with one's children in deep ways. I've always loved that Pastan poem, and now you have made it yours in a very special way. I left home when I was about 20, but thankfully I ended up only moving to another part of the same city, so I was home for dinner at least once a week. :-D Funnily enough, it was my parents who moved far away after they retired! I love the mood you captured in your poem. It's so true. Loved the cake. And thanks for sharing a poet new to me. Your poem is lovely, Linda, and captures the wistfulness we feel as our children head out the door into their own lives. Happy Birthday to all, and thank you for sharing your post card treasures! What a gift for your girls to have not just a cake to devour at the celebration, but also the poem that will provide them with a lifetime of hugs! And those two postcard poems couldn't have been more perfect, eh? I love both of these poems and both pulled on my heartstrings. Enjoy that fabulous looking cake! Lovely cake, lovely poem! Congratulations on your birthday palooza! 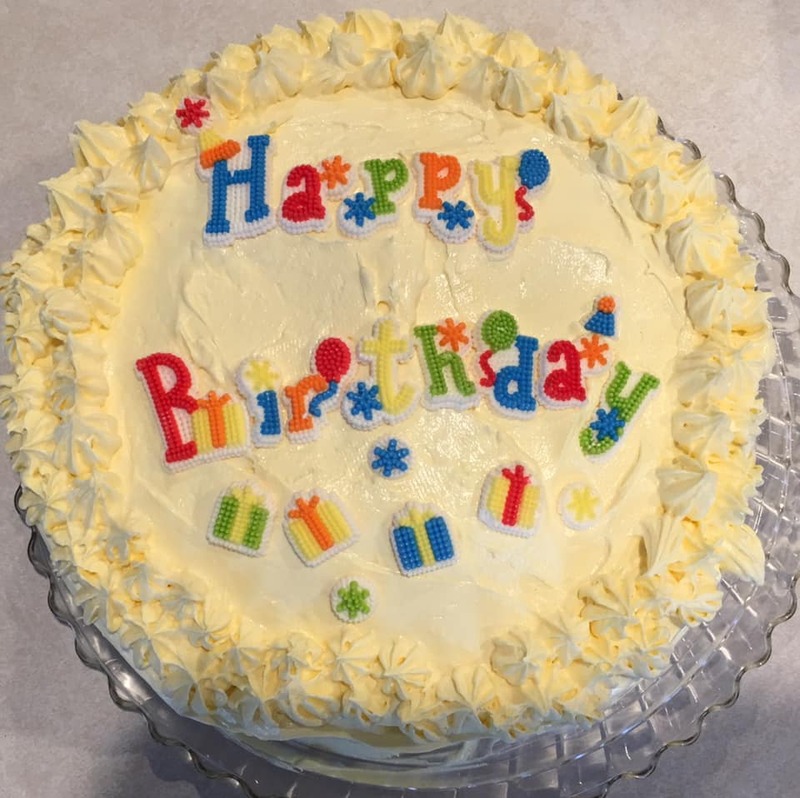 Lovely heartfelt cake and moving poems Linda–Wonderful how we can communicate via gestures without any words, and this grows through a lifetime–Happy Birthday to your girls! I am with you -- both Pashtan's poem and yours speak to me. My girl is 20, and I a thrilled to see her thriving and can't wait to see where she heads, but my heart looks back as well. I hope you had a wonderful birthday celebration. I'm glad my postcard finally made it! Oh, goodness--I'm tearful reading this just after Daisy's gone back to college. I'm enjoying the trio of Pastan--isn't she heir to Mary Oliver? (although I believe older), and look, my neighbor in Potomac, MD, too!